**UPDATED FOR 2016! ** I want my kids to know the apostles better than they know celebrities, athletes, or super heroes. I want them to know their names and faces. I want them to recognize their voices. I want them to love them. Who are these amazing men? What did they do before they were called as apostles? What kinds of things do they enjoy? And if they could pick an ice cream flavor, what would it be? 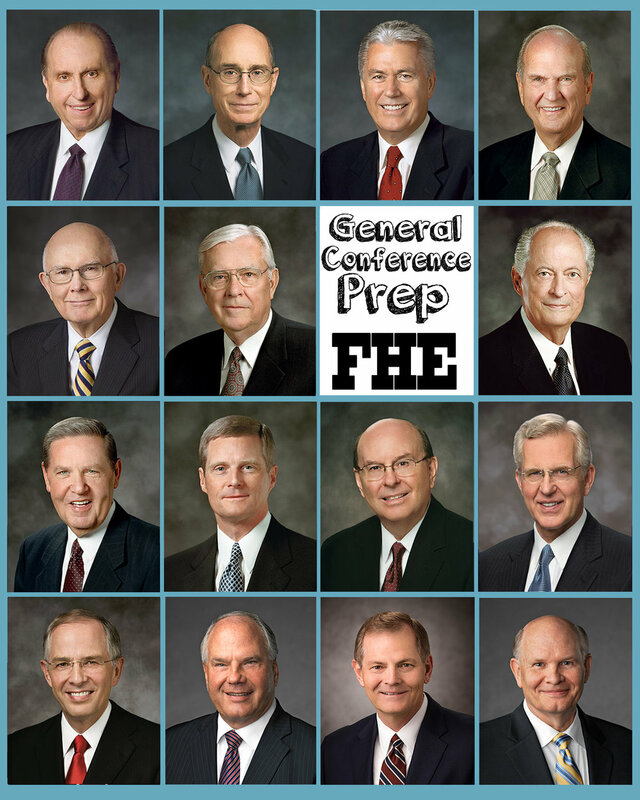 To help us find out, we've put together this adorable lesson to prep for General Conference. This lesson will help your family get to know the First Presidency and Quorum of the Twelve Apostlesa little better. 4) Lesson: Getting to Know the Apostles (attached) - Distribute the Apostle Cards among the family. Take turns "reporting" on each apostle. 5) Music Activity: The Apostle Song -To help our kids learn the names of the apostles, Whitney made up a song a few years ago (back when President Hinckley was still with us. So it's had to be modified and relearned a few times...) Her kids can sing it at lightning speed, and they love knowing the names of these 15 great men. 7) Treat: Chocolate Crinkle Cookies - President Monson loves chocolate, so we're sharing our Chocolate Crinkle Cookie recipe. Plus it's my husband's favorite cookie so win-win. ;) It's been in our family for years. Miix flour, salt, and baking powder. Set Aside. Chill dough for minimum 1 hour. Roll into balls, (I use my cookie scoop), then roll the dough balls in the powder sugar. Place on greased cookie sheet 2-3 inches apart.